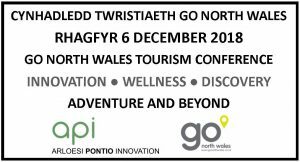 This year the Annual Go North Wales Tourism Conference is working in partnership with Arloesi Pontio Innovation by bringing together market leaders, tourism businesses and the captains of our industry from across Wales and the UK. Following the success of the 2017 Conference, which was attended by over 100 industry operators and professionals, the Conference this year will be taking place on Thursday 6 December 2018, at Pontio, Bangor. Theme of this year’s conference will be Innovation, Wellness and Discovery. Kate Humble who’s the author of three books – including the recently published Thinking on My Feet: The Small Joys of Putting One Foot in Front of the other. She has been a columnist for The Telegraph, Top Sante, and Country Smallholding and regularly writes for The Telegraph travel and weekend sections. The event promises to be the best yet. The third Go North Wales Tourism Awards will be held on Thursday 15 November at Venue Cymru, Llandudno to celebrate and recognise excellence and outstanding achievement by our businesses and individuals working in the tourism hospitality sector of North Wales. With over 220+ applications this year every nominee is a winner. The standard of applications was exceptionally high and every nominee who entered is a winner with all playing a part in what has been a successful year for North Wales Tourism. The publication is a spiral bound, A4 landscape brochure encompassing attraction leaflets/activity providers. The brochure is distributed to all accommodation members of North Wales Tourism; Reference copies to all Wales and Border TICs; North Wales & North West Libraries; Tour operators for itinerary purposes; visiting journalists; exhibitions etc. The attached information includes cost of including your leaflet in the publication, however front (inside) and back covers (inside and back) are also available (prices for these are on application). If you have not yet committed to advertise in the publication this year, it is not too late to do so. 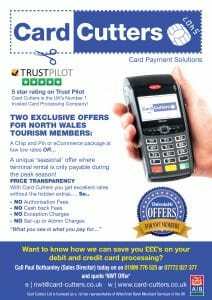 The campaign includes a pocket style leaflet featuring: attractions, activities, discount vouchers and a colour coded map plus a dedicated website with downloadable leaflet and special offer vouchers, QR Code, promotion on our social media channels and consumer enews database. We will also be attending Holiday and Travel Show, Manchester and the Holiday World Show in Dublin to promote what North Wales has to offer. Go North Wales are reviewing options to exhibit at Holiday World Show Dublin. With over 42k visitors at the show this is an ideal business opportunity to showcase your business to prospective visitors. We have secured stand space at the event however we are limited and therefore spaces will only be secured on a first come first serve basis. 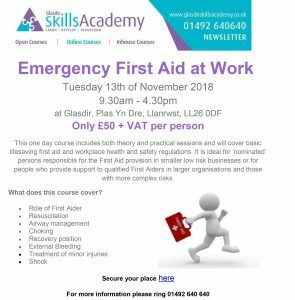 For further information please contact Deborah Nettleton/Eirlys Jones on 01492 539067/58 or email deborah.nettleton@nwt.co.uk / eirlys.jones@nwt.co.uk. North Wales Tourism has a wide range of digital marketing opportunities including banner and block advertising on the GoNorthWales website with the opportunity to promote your product to an active, engaged and loyal online audience. Making Tax Digital has been on the agenda for over three years, but now is less than 6 months away from compulsory implementation. From April 2019, VAT registered businesses with a turnover above the current registration threshold (£85,000 for the 2018-19 tax year) will have to keep digital accounting records. VAT returns for periods commencing on or after 1st April 2019 will need to be electronically submitted to HMRC using MTD compatible software. Put simply, businesses will now be required to keep their accounting records using accounting software. No longer will you be able to keep manual records, or manually submit a VAT return through the HMRC portal. Salisburys can help with the transition to MTD. From implementing suitable software and providing training, through to handling all your bookkeeping needs, Salisburys will be able to provide a solution. Action should be taken today to plan for the looming arrival. Bodelwyddan based recruitment marketing and support specialist JVP Group is charging forward with its growth plans, securing a number of prestigious contracts with some of the UK’s best loved zoos and leisure attractions. In early 2018, JVP were appointed to support the HR team at Twycross Zoo in Leicestershire with developing and managing their in-house recruitment function, with vacancies ranging from Visitor Experience roles to Animal Keepers, along with professional and office support positions. The fast-growing business has also recently secured a contract with Longleat in Wiltshire to deliver a talent attraction strategy for over 200 recruitment advertising campaigns, for job vacancies across Longleat’s diverse portfolio of attractions. The contract wins have been a direct result of JVP Group’s continued success supporting employers within the animal kingdom and wider leisure, tourism and hospitality sectors. Over the past 12 months JVP has extended its comprehensive and tailored service offering, introducing a range of additional solutions focused on saving employers even more time with the recruitment process, and helping promote a professional and positive employer brand. These recent service enhancements have proved great benefit to Twycross Zoo, with in-house recruitment support including a fully managed recruitment helpdesk, application management and assessment, along with improved talent attraction through enhanced employer brand development and extended audience reach. Karen Clarke, Chief Operating Officer at Twycross Zoo said “Here at Twycross Zoo we have an ambitious 20-year masterplan, and to achieve this we need to attract more fantastic people to our organisation as we continue to grow. In addition to Twycross Zoo and Longleat, JVP has developed an impressive portfolio of high-profile clients across the UK including Arriva TrainCare, Boots Hearingcare, NSPCC, Luxfer Group and Business Wales. Cath Harrison, Founder and Managing Director of JVP Group, said: “Whilst we support a wide range of sectors, the leisure industry and particularly the animal kingdom, is becoming a specialist area of significant growth at JVP. “The world of HR and recruitment is constantly evolving, particularly in relation to technology, social media, and the importance of employer branding. As the landscape changes, we adapt our services to ensure our clients achieve the best results for their recruitment campaigns and in the most efficient manner. JVP works closely with UK employers, providing comprehensive support to help them attract, assess and manage quality talent. JVP’s marketing and time saving solutions for in-house recruitment support includes; employer branded advert writing; multiple job board advertising; social media vacancy marketing; access to cloud-based applicant management software; fully managed pre-employment skills, knowledge and psychometric testing; applicant pre-screening; website careers page development; and recruitment helpdesk management.